All of us at Graphic45 are part of a fun May Arts Blog hop right now! For our honeymoon (quite a long time ago), the Baboo and I went to Hawaii - and the thing that we fell in love with the most when we were there, was all the greenery and vegetation. And so I wanted to bring a little of that lush jungle feel to this project and Graphic45's Tropical Travelogue papers were the perfect choice! I even found some lovely May Arts ribbon that looked like jungle vines to use on the front cover and it worked perfectly! Here's my Hawaiian "jungle book"! The book is made from an old book cover and the inside is done in what's called a tunnel book style. It's really fun to make so I thought I'd show you what I did from start to finish. Enjoy! There are also facebook and pinterest contests! Check the graphic45 blog on Monday 25th June for winner announcement! Your are a great artist love it! Love your travelogue! I too have started using old books....very clever! Gorgeous work, thank you so much for the tutorial! I love this book. How fun! Thanks for showing your process, too. What a beautiful mini, great idea for a travel keepsake! So beautiful! thanks a lot for the tutorial. What a great idea to use the G45 butterflies as masks. You are amazing!!! This is GORGEOUS!! I loveeeeeeeeee the colors and all the fussy cutting!!! I think is my fave of the day. I need me some canvas now too. You are such a talented, creative artist, Sharon! Wow! Thanks for the tutorial. I really appreciate it. I love your project and tutorial. Thank you for sharing. I want to make this too! What wonderful inspiration! Thank you. Wow! GREAT book! Love all the cutouts and piecing, wonderful job, and thanks for all the detailed step by step photos! Love this book! What an interesting technique. I'm gonna have to try it. Been trying to make a shadowbox frame for a friend and his wife, but have too many things to put on/in it. This would be the perfect solution. I'll let you know how it works out. Thanks very much! What a beautiful idea! It looks very challenging but well worth the effort. Really fabulous! Gorgeous book, loved it!! Thanks so much for sharing your amazing talent with us. Love it! Using the staples butterfly's as masks is brilliant. Thanks for sharing. I love this! I have some old books and will definitely give it a try! This hop just keeps getting better and better. Love the colors and techniques. Really cool book. love the album. With every hop I learn something new and can not wait to run try it. Thank you so much for sharing with us. This book is amazing! Thank you for the step by step! Covering an old book with sticky back canvas - that is genius! I love it! Fabulous book! Your Book/ frame is fantastic! love the papers, they are so beautiful! Really Awesome! It's a piece of art! Thanks for sharing the step by step tutorials! What a creative and beautiful project. You have inspired me to make one of my own. Thanks so much for the tutorial. perfect. what a beautiful box. and thanks for the tutorial how to make it. This is really, really cool! I love the "jungly layers! And the 3D pics. Thanks so much for taking the time to walk us through it! 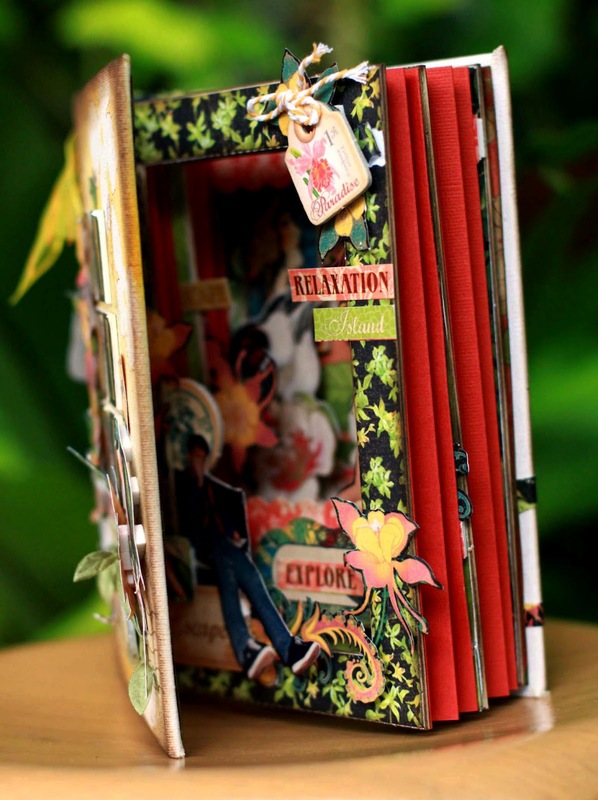 I love altered books- and making an altered book with G45 paper- heaven! what a great idea! Repurposed books are the best! Yours is just great! Thanks for the tutorial! Wow! What a great little book. So cute. That is such an awesome tutorial!! I love it! And what a beautifull Jungle-Surprise! 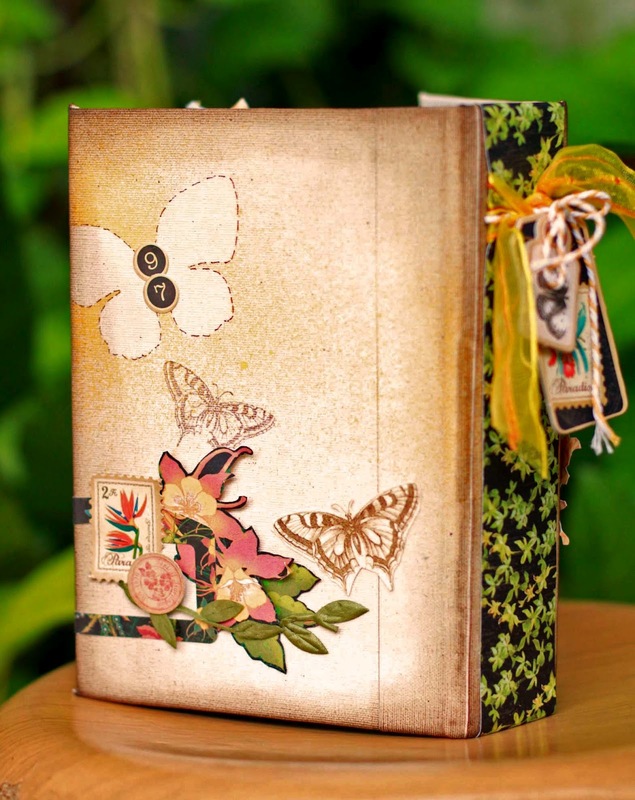 Great idea for an altered book --- thanks for the tutorial! val from IL. Very beautiful! Thank you for showing how to do the inside pages and for the idea of using the old book. I've altared using the pages already in the book but never taken them out and made my own. Also love the idea with the butterflies. So cute! That is a beautiful and exceptional album. I love it and your very informative tutorial. Keep up the great work. Gorgeous book by a talented artist! Thank you for sharing your creation and the wonderful tutorial today! I love little books and your is gorgeous! Thanks for the tutorial, I'm going to make one. I'm going crazy this week with all the amazing talent and projects I'm seeing, can't wait to try your jungle book project at home..so awesome! What a super project. I love the colors and the lovely flowers! Thank you so much for creating and sharing it. Love your work.. thanks for the explanation.. Such a wonderful 3D effect I am so tempted to try this project. It is just wonderful. Thank you for sharing your technique. What a special project. Really nice. Just gorgeous - I tend towards neutrals so it's so inspiring to see something with so much glorious colour. And thanks so much for including all that how-to information. Great Travelogue. I love the bright colours. wow, I love your sharing Sharon! so happy to see how you made this into 3D effect! you made me love Graphic 45! Esp LITTLE DARLINGS!!!! AWESOME idea! DH and I are going to Hawaii this fall for the first time, and I am going to be able to lift your fabulous idea for the travel book! Thanks so much! Wow...now that is reaaly something, I want to get out my bug spray. Wow! What a great book, you have given me many wonderful ideas for my next journal. Keep up the good work. Thank you May Arts and Graphic 45 for the giveaways. That is so cool!!!! Miss Hawaii very much. what a great idea! And thanks for sharing the accordian fold to make the images appear 3D. I love this paper line and I love your use of this line. What a beautiful project Sharon! You have put a lot of thought and care in this! Thanks for chance to win a great prize too! Wow, love the book, and all your cutting and embellishments. Love that paper collection and your travel log is lovely. Fabulous tunnel book and i love the tutorial! I love the depth of this project - and what a great way to recycle an old book! Sharon, thanks for sharing your unique creation of a tunnel book. 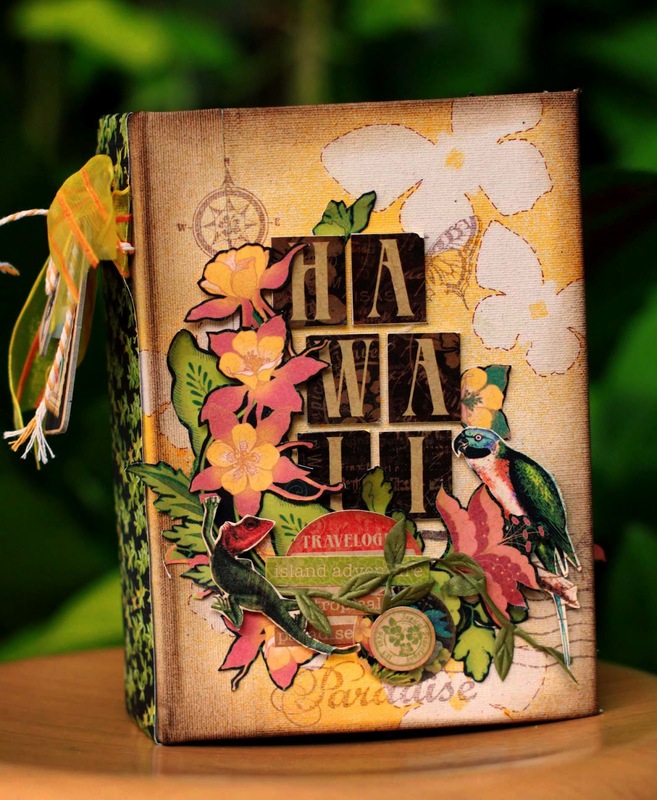 You certainly brought out the colors of the Graphic 45 Tropical Travelogue splendidly with the use of the May Arts ribbons. I feel so inspired! Oh Sharon!....I'm really shocked about this project!...IT'S AMAZING!! !....all the details and the papers, what a combination!...wonderful! I adore this book thanks for the tutorial. Thanks for sharing your ideas! That's one AWESOME album! Great project!! Would a great idea. Absolutely have to do this. This was a new kind of homemade book to me. It's a great idea. Thanks for the pictures and instructions. The papers and ribbons you chose were perfect for your theme. Thanks so much. Oh, how I wish I could have had this collection a few years ago when we went to Hawaii. Our scrapbook from that trip would be a coffee table book today. Wonderful blog hop! So loving Graphic 45 and May Arts! Your Jungle Book is awesome! thanks for the tip on using an old book cover. Love the G45 paper that was used. Love your book and thanks for telling us how you did it. I have to try this! I think it is magical the way Graphic 45 papers inspire so many beautiful projects! What a treasure you have created! Thank You for the detailed instructions--I always appreciate that! what fun! Great projects! Thanks for sharing. Oh, I just love this idea & of course you can't go wrong with Graphic 45 too! TfS!!! Wow! That's amazing - I LOVE it! What a fabulous keepsake of your honeymoon. That is such a neat idea to use an old book! And the results are fantastic, so clever! Thank you for sharing your talents! Oh my goodness...this is just stunning. I so appreciate that you shared your process with us. this is unique and darling, what a great keepsake for a little one. you are very talented! Excellent book. I think i would like to make one of these.. Wonderful project - so much detail! What an awesome tunnel book. Great project. Great project! The tunnel book inside the recycled hatd back cover was a real inspiration! Fabulous album!!! Love the tutorial!!! Such a cute book. Thank you so much for sharing it and for providing instructions. Have a great week! This is such a fun book! I love all the layers! What a sweet idea and fun project. Your picture tutorial was great. I love your Keepsake book..it turned out beautiful..such wonderful creativity and marvelous work..Loving the Graphic 45 papers and lovely pictures. Love your tut on the book! Your layers are simply devine, great job! I love how you refurbished this!! Wow your Jungle Book is just amazing. Thank you for sharing. Your Book is fabulous! Love the fussy cutting and paper layering! Just amazing! Who would have thought that an old book and sticky back canvas could look so great. Love what you did. It looks like it took a long time to make. I had never seen this technique before and I think it is amazing!! I love how you clearly explained each step and provided photos, thank you for that. So many people don't do that and a tutorial is so much easier to follow when the directions are clear and the photos good! Beautiful project that showcased this paper in a wonderful way! Marvelous - from the actual project itself to the detailed pix showing how the book was created..thank you! Such a beautiful and colorful book, thank you so much for sharing it. This is just gorgeous! What a fabulous idea! What a great altered book. This is fantastic and so cute. Great job and I just have to pin it to share with friends. You are very talented!!! What an amazing project! Thank you for sharing! I'm so happy to the array of mini-albums on the blog hop. This is exceptional, as is the step-by-step pictorial tutorial. VERY nice. Thanks for sharing it. I love your mini album! The designs and patterns are so lush...really giving a feel for the tropics! And the way you incorporated your photos makes for a whimsical and unique memory of your honeymoon! Great little book and I love the paper. Thank you for the tips and techniques on building the book. Very creative use of both the paper and the ribbon-thank you for sharing. I just became a follower of your wonderful blog. I found it on this blog hop and I am so glad. Your book is stunning and makes me think fondly of my old home, Hawaii! Gorgeous book - great instructions too! Thanks for the tutorial on this project! I have heard of folks doing this but had not seen how to do it! Thanks so much, lovely work. What an amazing book. I just can't get over the versatility of these papers. Thanks for showing us how you made this book, too! Super cool idea! Love it! Thank you for the instructions. I love the details in your work. Really beautiful. the more i look at these design team projects the more I am inspired. Now to have the time to begin and finish a project. Thanks for sharing. Sharon!! I super love the layers! U're amazing! 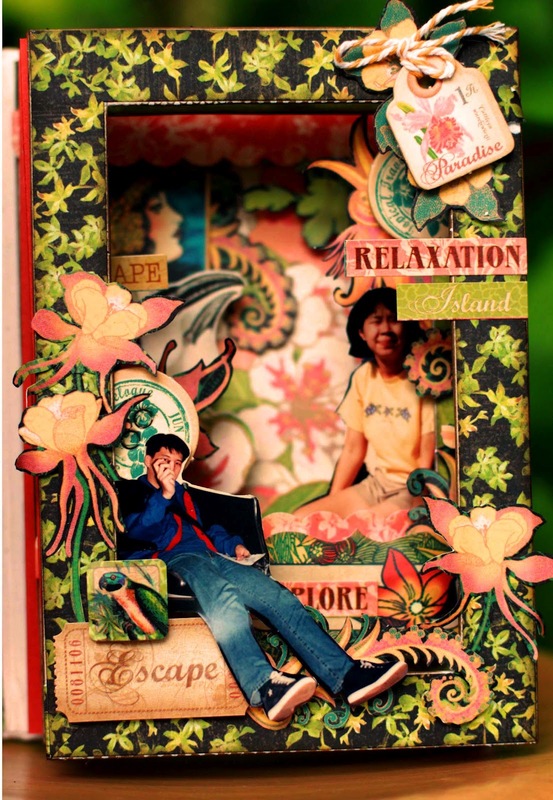 hi Sharon, getting know you from my scrapbook friend Ria Nirwana, and I just love everything you created. and really a cool project u'd been making. Beautiful project!! Thank you for the photo tutorial. It's so nice of you to take the time to put together the tutorial. This is a cute book project. Beautiful paper for a beautiful book. Thanks for sharing how to make it. Great 3D effect! So awsome, I got to give it a go! Love it!!! Fantastic use of colors. The papers are beautiful in this book. Thank you for sharing. Wow! what a fun way to remember your trip. I love what you made. Thanks for Sharing. Sooo tropical....loks like fun to make...never been to Hawaii but could try book for other travels, thanks for the ideas!! Wonderful mini album. Thanks for sharing. France. What an amazing jungle book! Great instructions too. Your fussy cuts are awesome...great tropical jungle!! That bakers twine and that leaf ribbon are perfect touches to the G45 Tropical Travelogue! Wow! I used to live in Hawaii and I have to tell you that your use of colors is right on! Love your little book and you captured its essence perfectly. I also love how you used the metal butterflies as masks! Gorgeous creations! Thanks for the inspiration! I love your Hawaiian jungle book! Fabulous textures! Mahalo for sharing. A truly Unique and very clever project! Wonderful Work. thank you for sharing it. I love books. This one is great. What a delight, another amazing project. 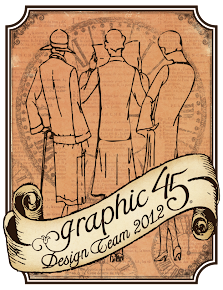 Just love Graphic 45 & May Ats Ribbon. Spectacular!!!!!! LOVE the depth and demention you achieaved!! Hawaii has been on me & my husbands bucket list for 43 years! This would be the perfect object to take along. Thank you so much for the tutorial. I'm going to give it my best shot & hopefully it will come together. Thanks again! Wonderful, wonderful, wonderful. Love it. Such a neat book...thanks for sharing how you made it!